A young, active male presents with knee pain and swelling after rolling his ankle a week earlier. 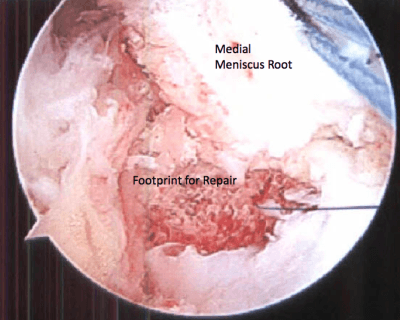 When an MRI reveals a meniscus tear, the author recommends arthroscopy and medial meniscus root repair. MRTs account for 10% or less of all arthroscopic meniscectomies . Clinical diagnosis can be difficult, particularly when MRT occurs in isolation, but magnetic resonance imaging (MRI) allows for accurate diagnosis. Current research demonstrates restoration of the biomechanical function of the meniscus, pain relief, and return to activity following repair of acute, traumatic MRTs. Arthroscopic repair techniques, including suture anchors or transosseous suture fixation, lead to comparable results . A 23-year-old active male presented with right knee pain and swelling. He complained of pain in the posterior aspect of his knee worse with ambulation and deep knee flexion. One week earlier, the patient had taken a wrong step and rolled his right ankle; he felt his knee shift and pivot underneath him and fell to the ground. He noted immediate swelling, which improved somewhat after 48 hours. He presented at an urgent care facility the following day and was given a knee immobilizer and crutches. Plain radiographs (weight bearing AP, PA flexion, lateral, and merchant) found to be normal. 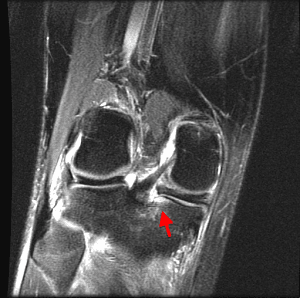 MRI shows acute posterior horn medial meniscal root avulsion (Figure 1). Figure 1. Coronal T2 MRI scan showing complete avulsion tear at the root attachment of the posterior horn of the medial meniscus. 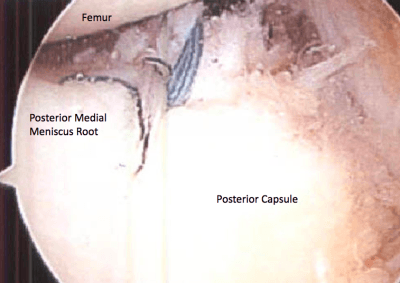 The patient underwent right knee arthroscopy with posterior horn medial meniscus root repair. The patient was placed supine with a single-shot femoral nerve block and general anesthesia. His right lower extremity was placed in a leg holder with a well-padded tourniquet. Antero-lateral and antero-medial arthroscopic viewing and working portals were extablished. 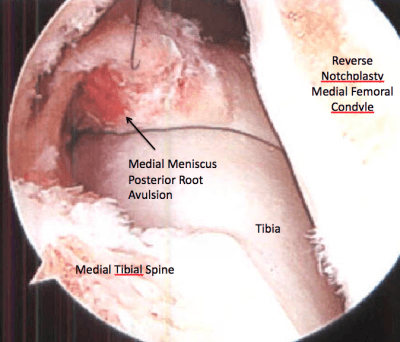 A detailed diagnostic arthroscopic examination was performed and the medial meniscus posterior root avulsion was identified. A reverse notchplasty of the medial femoral condyle was performed for adequate visualization and working space (Figure 2). A postero-medial working portal was established and a cannula was placed. While viewing through the lateral portal, a suture lasso was brought in from the postero-medial portal and placed through the posterior capsule and posterior horn/root (Figure 3). The suture lasso was retrieved from the medial portal and a high strength, non-absorbable #2 suture was doubled over; the looped end was retrieved from the postero-medial portal. The free ends were also retrieved from the posteromedial portal and placed within the looped end and brought down to the meniscal tissue. The suture was retrieved from the medial portal and clamped. This was repeated with a second suture (Figure 4). A small oblique incision approximately 2 cm in length was created just below Gerdy’s tubercle. Muscular fascia was elevated off Gerdy’s tubercle, and the tibial guide for the flip cutter was brought in through the lateral portal. This was placed at the meniscal root attachment site and the bullet was placed on the proximal lateral tibial cortex underneath the anterolateral musculature. A 6-mm flip cutter was inserted while viewing arthroscopically through the anteromedial portal (Figure 5). Alternative viewing can be from the posteromedial portal. After appropriate placement, the flip cutter was used to ream in a retrograde fashion to a depth of 1 cm (Figure 6). A suture retriever was placed through the tunnel and used to retrieve the free ends of the meniscal sutures out the anterolateral tibia. Manual traction on the sutures showed excellent reduction of the meniscal root to its attachment site (Figure 7). The knee placed at 15° of flexion and the sutures were tensioned and tied over metal button in a standard fashion. Figure 2. 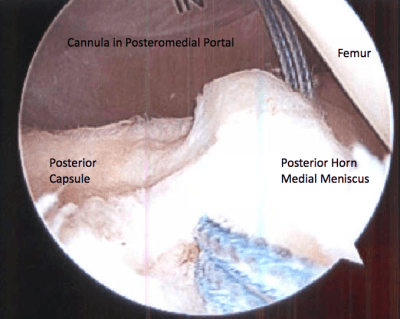 The posterior medial meniscus root tear is identified with the arthroscope in the lateral viewing portal. The root is avulsed completely from its attachment site on the tibia. Reverse notchplasty of the medial femoral condyle has been performed for ease of viewing and instrument passage. Figure 3. Suture lasso is used to pass high strength, non-absorbable #2 suture through meniscocapsular junction after establishing a posteromedial working portal. Figure 4. Camera placed into posteromedial portal for viewing. Two sutures placed across the meniscocapsular junction of the posterior root of the medial meniscus. Figure 5. Placement of a 6 mm flip cutter into the attachment site of the medial meniscus root with use of a tibial guide. Figure 6. Trough created at the footprint of the medial meniscus root 6 mm in diameter and approximately 1 cm in depth. Figure 7. The final repair is completed with reduction of the posterior root of the medial meniscus to its attachment site. The patient was placed in a postoperative brace locked at full extension. Partial weight-bearing with crutches was allowed at weeks 0-2, followed by weight-bearing as tolerated, with brace locked in extension, at weeks 2-4. Early range of motion of the knee (0-90° as tolerated) was allowed for the first 4 weeks. At 4 weeks, slow progression to full active range of motion was allowed. The brace was discontinued at week 6. The patient returned to jogging at 4 months, with progression to cutting/pivoting and full sports participation by 6 months. The patient presented for a 6-month follow-up with full range of motion. He reported no pain in his knee and was back to full participation in all athletics. MRTs disrupt meniscal biomechanical and kinematic properties and can directly result in degneration of the knee articular cartilage. One biomechanical study showed no difference between total medial meniscectomy and posterior MRT in the resultant peak tibiofemoral contact pressure . Recent research has highlighted the importance of early diagnosis and treatment. Clinical symptoms and physical examination can be non-specific, and advanced imaging with MRI is typically required for diagnosis. Although MRTs have historically been treated with partial or complete meniscectomy, there has been a recent trend toward repair over meniscectomy for the treatment of MRTs, particularly in the young patient with minimal to no degenerative changes. The reasons for this are highlighted in a retrospective study of 58 patients who underwent either meniscectomy or repair for treatment of a MRT . The researchers found that although there were improvements in both groups in subjective outcome scores, the repair group experienced greater improvement and less arthritic progression at an average 4-year follow-up . Repair of MRTs, particularly in the cruciate ligament-intact knee, requires the utilization of advanced arthroscopic techniques and can be technically demanding and time consuming. The optimal repair technique, and long-term outcomes of the available techniques, remains largely unknown. This is an area that requires further investigation. Sommer Hammoud, MD, is Assistant Professor, Sidney Kimmel Medical College at Thomas Jefferson University, Philadelphia, Pennsylvania. She specializes in sports medicine at The Rothman Institute. Papalia R, Vasta S, Franceschi F, et al. 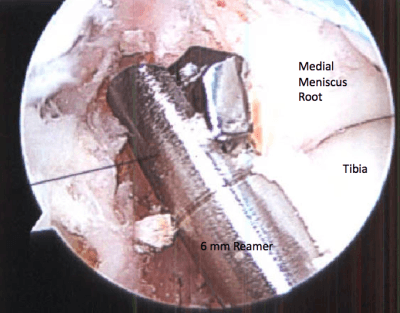 Meniscal root tears: from basic science to ultimate surgery. British Medical Bulletin 2013;106:91-115. Allaire R, Muriuki M, Gilbertson L, et al. Biomechanical consequences of a tear of the posterior root of the medial meniscus: similar to total meniscectomy. J Bone Joint Surg Am. 2008;90(9):1922-1931. Kim SB, Ha JK, Lee SW, et al. 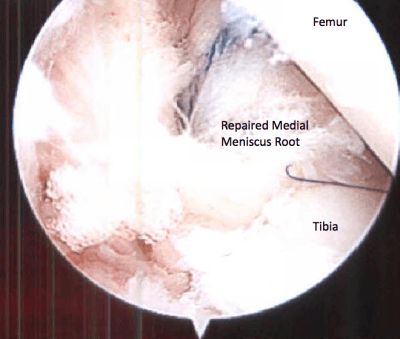 Medial meniscus root tear refixation: comparison of clinical, radiologic, and arthroscopic findings with medial meniscectomy. Arthroscopy. 2011;27(3):346-354. Next articleIs This the Research that Will Change Your Practice?